Late March sees the release of Transvision Vamp’s first two highly successful album releases from the late 1980s, Pop Art and Velveteen. The albums are being released as 2-CD sets, each featuring a bonus disc of B-sides and rarities. Signing to MCA in 1986, British rock-pop act Transvision Vamp enjoyed massive chart success in the UK and abroad before disbanding in early 1992. In late 1987 they released a cover version of the Holly and the Italians song, Tell That Girl To Shut Up; a few months later their follow-up single, I Want Your Love, made number 5 in the UK charts. Their debut album, Pop Art was released in October of that year, reaching the British Top 5. Pop Art was Transvision Vamp’s debut album and is celebrating its 25th anniversary with this 2CD re-issue. Led by the forthright Wendy James, backed up by the songwriting of Nick Sayer and musical muscle of Dave Parsons and Tex Axile, the band provided a splendid antidote to the Stock-Aitken-Waterman dominated pop charts of the late 80s. In the brief finger of time after the breakthrough of acid house and before Madchester, the group brought some old-fashioned punk sparkle to the charts. The album’s big single I Want Your Love was perfection itself – big, brash, stupid, loud, funny, clumsy, short, spiky, and became a huge hit. With its snarling guitars and punk rush, it all seemed incredibly exciting, certainly to teenage audiences who had missed out on new wave the first time around. Pop Art was released in October 1988 and reached No. 4 on the UK charts, where it spent 32 weeks. This expanded edition, through all its mixes, BBC sessions and B-sides demonstrates how hard the group worked and how much intelligence went into their 15 minutes of fame. It was a bold start for a group that were destined for big things and had the chutzpah to put their money where their mouth was. With its hatful of influences and a barrel load of swagger, Velveteen is the absolute definitive article for the group: 1989 was the group’s high-water mark. Singles were stripped off it and it cruised to the UK No. 1 album slot. Baby, I Don’t Care was the first single with its cheeky appropriation of the Troggs’ Wild Thing riff and signalled the group’s brief imperial phase. It was a superb hard rocker, full of the requisite joie de vivre of a band achieving their goals. This was followed by The Only One, bright, synthesizer driven pop; Landslide Of Love, a tremendous Phil Spector homage; and Born To Be Sold, their ultimate list song, stating how artists from Elvis to Margot Fonteyn were there to be sold, and culminated with James singing Sayer’s words that she was going to make her own history. Velveteen was released in June 1989. It was big, bold, brash, a bit daft, funny and exhilarating, all the things that rock’n’roll is supposed to be. And Transvision Vamp had rock’n’roll in spades. 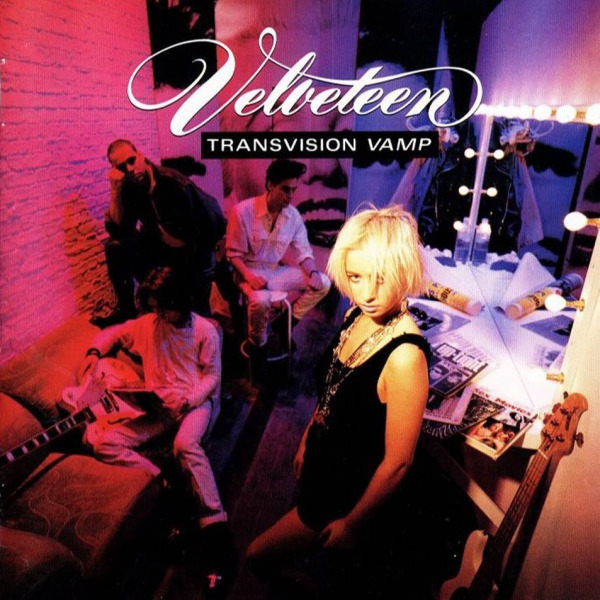 Today, with all its bonuses, session material and b-sides, it is a vibrant flashback to when Transvision Vamp were there at the cutting edge, with all the exuberance, passion, anger and naïveté that pop breakthrough acts possess.